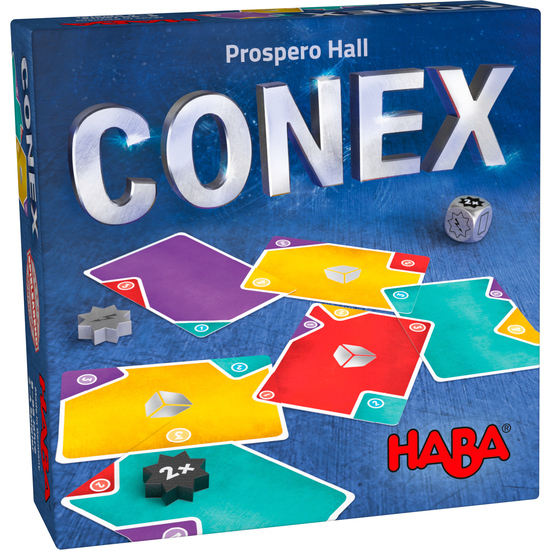 The players look for the best places to place their cards with the most valuable CONEX corners. Note: A change of perspective might be needed! They play any action stars you have earned. But only the player who manages to keep plan ahead will become the CONEX master. Contents: 52 cards (including action cards), 1 starting player card, 1 point tableau, 4 player markers, 2 action stars (2x star, lightning star), 1 symbol die, 1 set of instructions. Short game instructions: • Take a game marker and place on the starting space of the point tray. • Deal 5 cards to each player from the draw pile. • Lay down a hand card (colored CONEX corner on a face of the same color of a card or of the pointtray) or draw two more cards from the draw pile. comply with action cards(plus 2 card, card with die) or play action stars. • The game ends when the final space on the point tray is reached or surpassed or you can no longer lay down a card. • The player who has the most points wins the game.